even though it was not a fancy evening gown draping, still, drape is drape. Below was the silk fabric. heavy and full, a gift from my sister more than 10 years ago. I've been saving it relentlessly. I guess for two reasons. 1:fabric hoarder symptom....2: I had too much things on my mind or + too much fabric to cut.. Here is how I made it . fold it like doing origami. fold again so to form an angle, in order to cut a hole. here it goes.a circle . cut and done. it is a bit too big........though......but no regret. 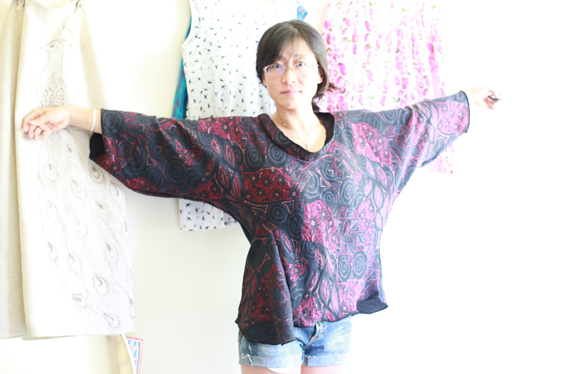 I hanged it around my own neck and measured the length and sleeve length. using a few pins to secure the position, so I might know where to cut. done. here are the 4 corners. put 2 pins under the arms, there went the scissors. apparently I cut too much (again!) it is okay to have an uneven blouse as it is supposed to be loose.......but it can not be too tight..
the triangles that were cut off saved my blouse. look at the waist line, the "special design details", was not it nice? as the collar was too big, I cut straps using the left over triangles and attached it to the collar. Thanks for watching. Hope you liked this tutorial. sometimes it is cool to sew up a thing quick as a wink. especially it is for myself. 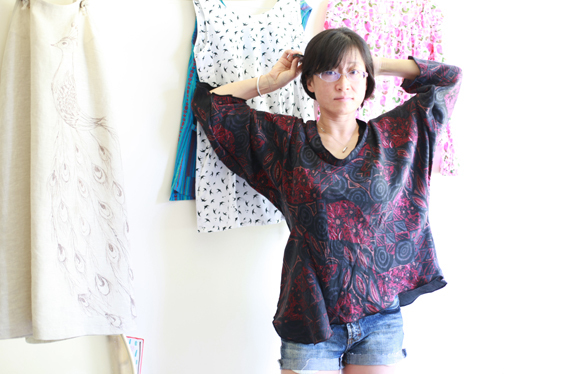 I CAN spend a few weeks on one single garment, but I often choose to do it fast for pleasure whenever it is possible. 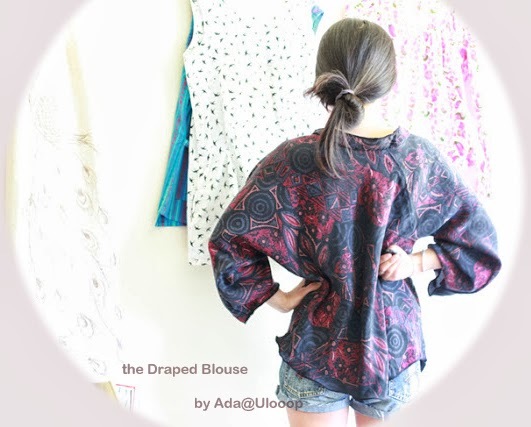 that is really cute ada, i love the drape to it and the fabric is wonderful, especially the print. very nice job, i wish i was a skilled enough seamstress to think of cutting that from scratch without a pattern! that's awesome...do you sew for others?